This eBook provides a step-by-step guide that you can use as you embark on the conversion of your ILT program to a Blended Training program. These inputs will certainly help you in creating a high-impact Blended Training program. More specifically, you can use the tips and best practices to optimize your current Blended Training programs. 1. 5 examples featuring corporate training on how you can enhance the impact of ILT by adopting a blended training approach. 2. 2 examples featuring how you can enhance the impact of ILT by adopting a blended training approach in higher education. You go for blended training because you want to reach high impact rates. Need I remind you that this is not something that comes the moment you decide to leave good-old instructor-led training? 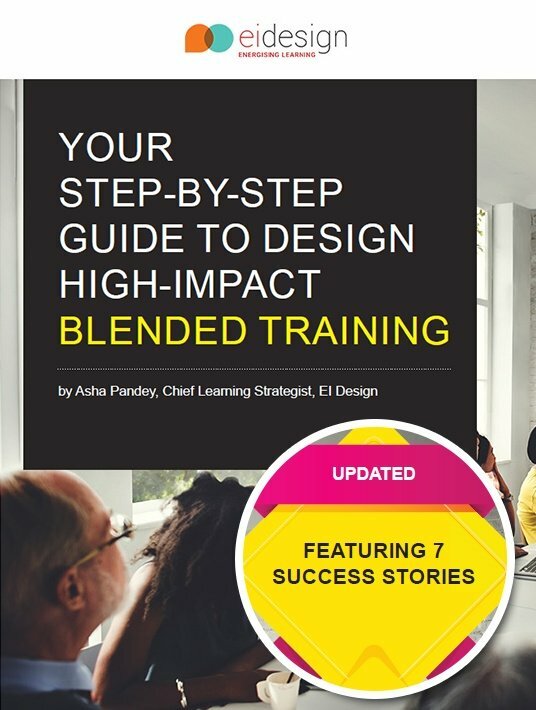 Fortunately, there is help for designing and implementing blended training programs in the form of this step-by-step guide by EI design, plus seven success stories. After reading it you will know what to keep, what to lose, what to bring in and how to blend it altogether and deploy them in a way that will guarantee you the high-impact result you aim for.